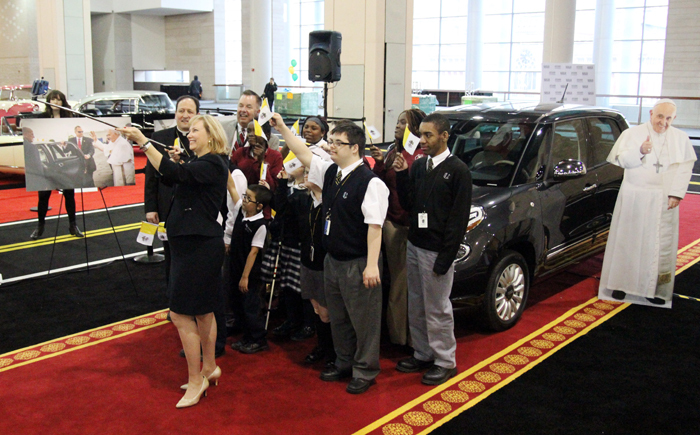 Donna Farrell, Executive Director for the World Meeting of Families  Philadelphia 2015, takes a selfie with Bishop John J. McIntyre, David Kelleher, Chairman of the 2016 Philadelphia Auto Show, and students from the special needs schools of the Archdiocese of Philadelphia. 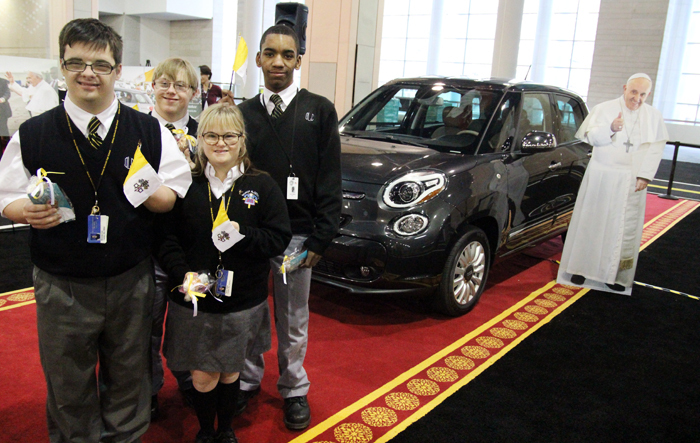 The Fiat 500L – one of two cars used by Pope Francis during his visit to Philadelphia last September – was publicly sold at auction Friday night, Jan. 30 at the Philadelphia Auto Show Black Tie Tailgate at the Pennsylvania Convention Center. In bidding that lasted 11 minutes among 19 in-person and remote auction bidders, the car was secured by Michael Chapman of Chapman Ford with a winning bid of $82,000. The proceeds will benefit Catholic ministries. Read more about it here. 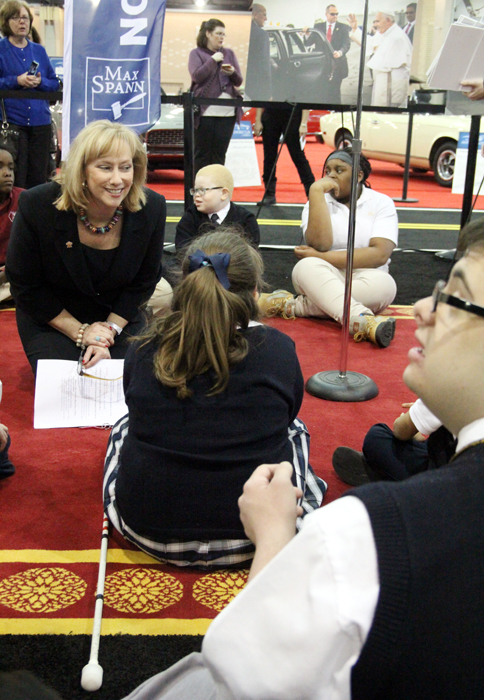 Donna Farrell, executive director for the World Meeting of Families, chats with approximately 20 students from the archdiocesan schools of special education while sitting on the red carpet Pope Francis walked on while in Philadelphia. 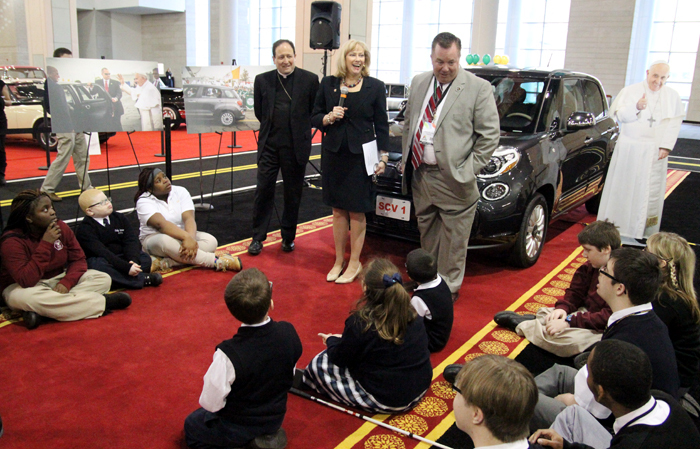 Donna Farrell, Bishop John J. McIntyre and David Kelleher speak to the children in front of the pope’s Fiat. 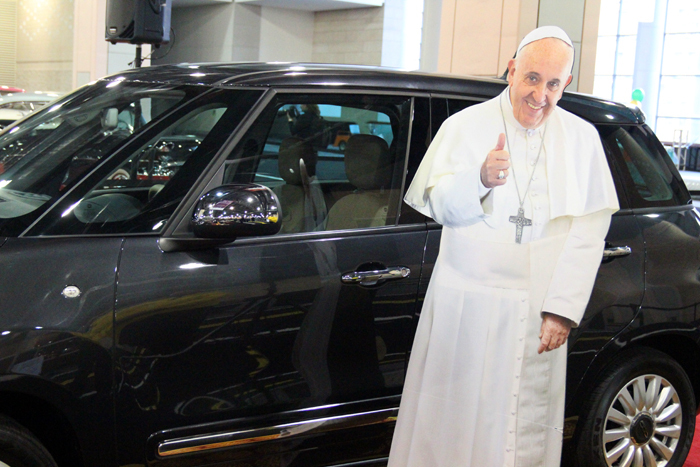 Bishop McIntyre oversaw operations related to the World Meeting of Families Philadelphia last September and is responsible for overseeing the ministries of Catholic Social Services in the Archdiocese of Philadelphia, which will receive the proceeds from the sale of the car. Special needs students help tell the story of Pope Francis’ visit by holding pictures from the World Meeting of Families. 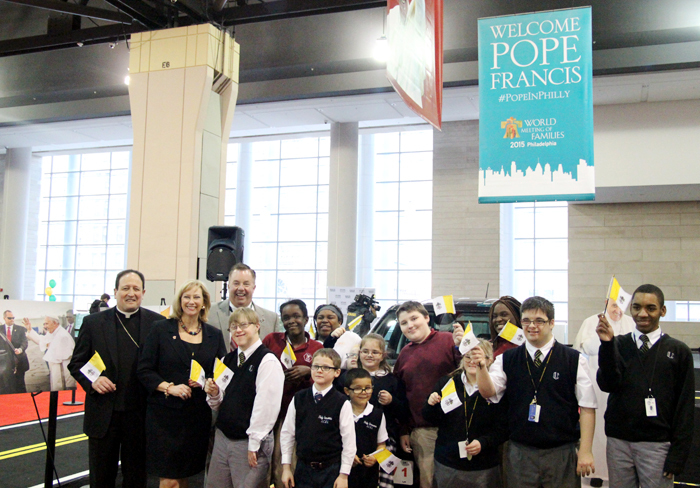 Donna Farrell takes a selfie photo with Bishop John McIntyre, David Kelleher and students from the special education schools of the Archdiocese of Philadelphia. 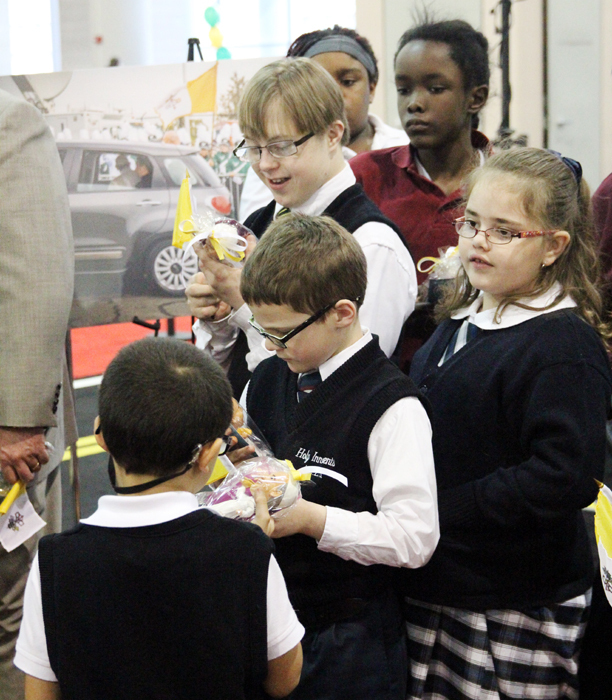 Students received bobblehead dolls of Pope Francis after they got a tour of the Fiat he rode in while in Philadelphia. 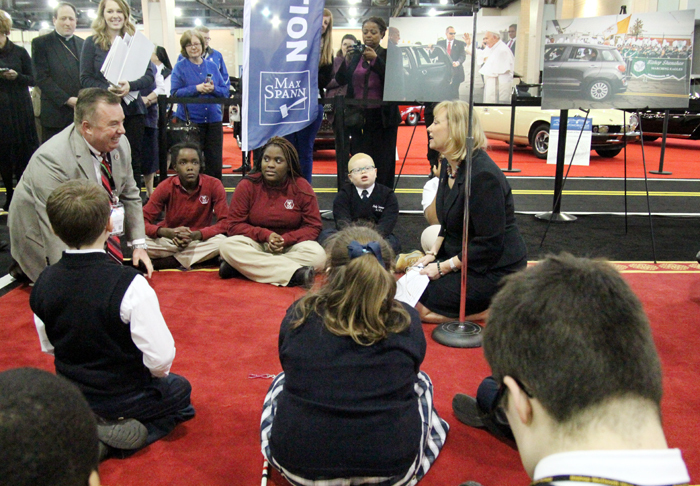 Sudents from Our Lady of Confidence School are excited to get a peek at where the pope sat while riding in the Fiat while in Philadelphia.